Well to be fair to the past, the spelling of place names and even people's names was fluid. You might see headstones side by side, for two generations of the same family, where the surname is spelled differently. The name of a town in the early 18th century might be different to the name we use today. Purely phonetic spellings might be dropped or they might become fixed. There was no rule, but one spelling generally rose to the top of the pile and became the 'right' way to spell the word. Headstones use many variants of DIED, DYED, DIE'D, DIETH, DYETH and so on. In my area the small town now called Heage can be found on some stones spelled that way or as Headge, the two versions being used interchangeably for a hundred years. Leave it alone. The customer is probably illiterate and will never notice. Here are some I've seen recently. 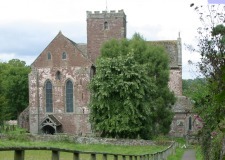 Dore Abbey: The use of random upper and lower case letters in GEORgE and BLACKmoorE. The letter carver may not have been very literate. The letters are all well formed and the right way around, but use of case is, shall we say, inconsistent. St Peter, Oare, Kent: A mixed bag here. Much of the spelling and lettering is good, but it also has: ELIZABETH, but the Z used to be a C; DECEMB but the C was originally reversed and the last part reads IN HAR ADGE YERES 2. The HAR may mean HER, or it may be an attempt at the name of the village, Oare. ADGE YARES seems to be AGE YEARS, but then comes a squiggle and a 2 on its side. Is that 2? 82? 28? and why is the 2 sideways? We will never know. But the carver also had a stab at the first word at the top right of the stone before turning it round and starting again. 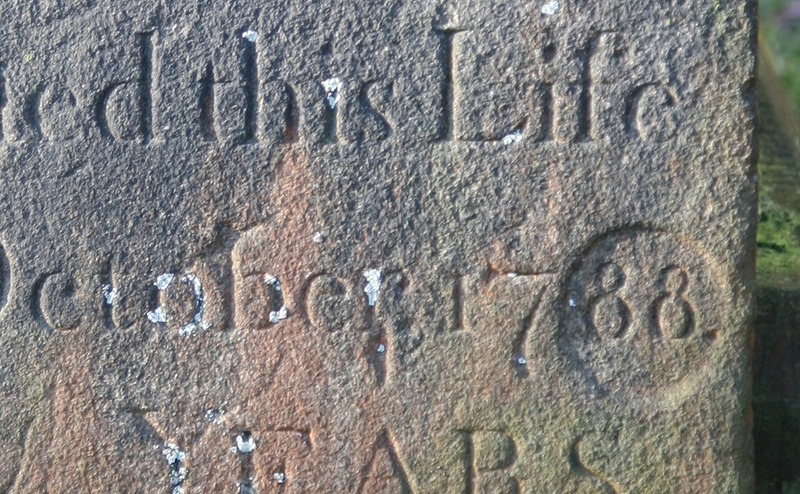 St Alkmund, Duffield, Derbyshire: This young man departed this life in 1788. When the stone was first cut though, the year probably said something different. An alternative explanation for some of the patched stones or recessed areas is that the stone chipped badly when the cutter was working and could not be reworked to disguise the break. This circular recess is less common than a rectangle just big enough to rework the error. All Saints, Bakewell and St Mary's, Astbury: On the left, a stone with a slot reaching all the way to the edge. The slot may once have held a patch which did not stand the test of time. On the right is a patch which matches perfectly, neatly fills the hole, has stayed in place and again we will never know why it was put there. So much for the successful concealment of errors or damage, which means we can't tell what happened and why the fix was carried out. 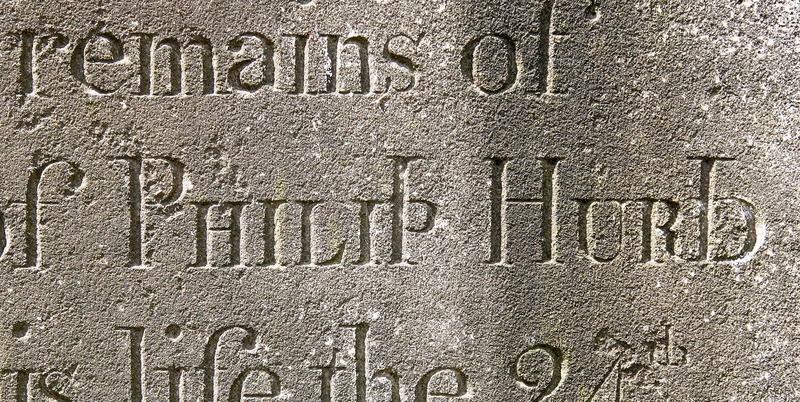 But what of simple overwriting (over-carving), where a letter carver has just carved another letter or number on top? 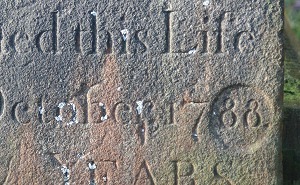 St Mary, Denby: This example has at least two digits in one spot, possibly three. I can't tell what the original digit was or which others have been tried. It looks like at least three attempts have been made to pin down the date of death - 3, 6, 8 and 9 are all possibilities. 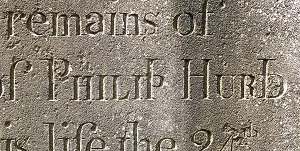 St Peter, Ellastone, Derbyshire: This one shows perhaps a lack of knowledge about letter forms in general. I don't know what strokes on these letters came first, you be the judge. 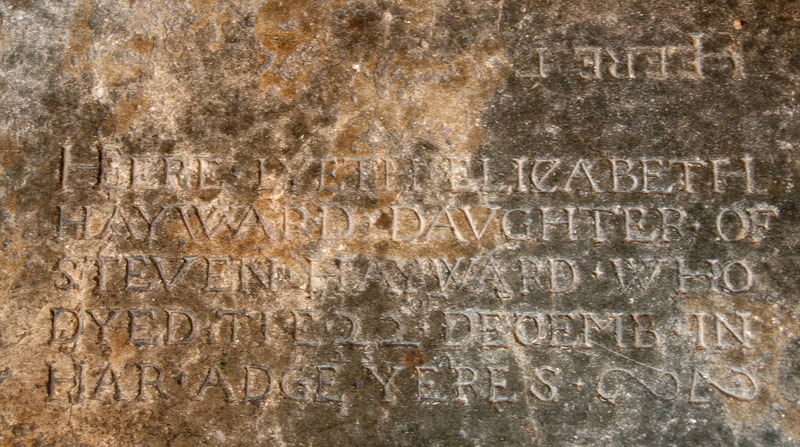 My money is on Hannah because the spacing of that name is much wider than the other words in capitals on the stone, as if they were spreading it out to cover up Elizabeth. The letter carver had a bad day at the office. I wonder if he was paid? The thick stroke of the M seems to be filled, which would make that the 'wrong' name, which means the lady's name was probably Ann. I picture the grieving husband by the graveside as the stone is being erected... "Mary? Who the hell is Mary?" Finally, two contrasting approaches. Leave it alone and hope nobody will notice? Or make the change and be certain that everyone will notice, put their finger on the guilty letter and draw attention to the error for ever more. Like the worn out spot on a map which says "You Are Here" - people can't resist poking it with their finger. 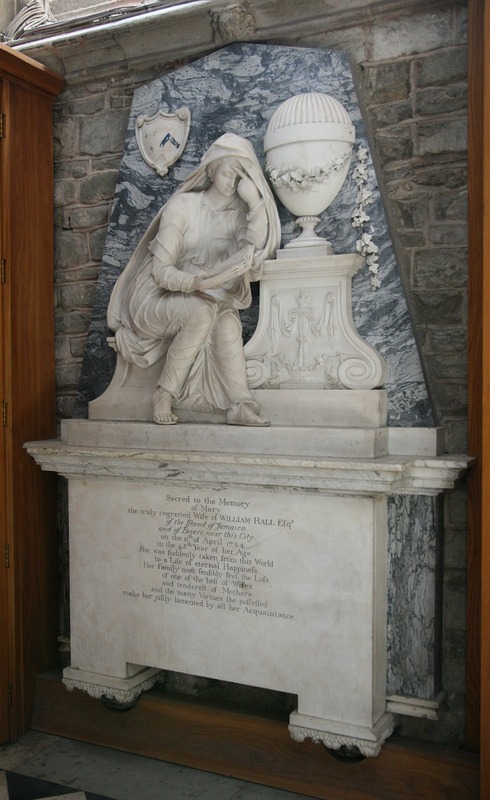 This large and expensive memorial in Worcester Cathedral, to the spouse of William Hall Esq, states that she was "the best of Wifes"... I mean, "best of Wives"... better fix that. Pretty sure nobody will notice. Except for the thousands of people who noticed, put their grubby finger on the correction and left a grey smudge the size of half a crown. You can see it from 20 feet away. They should have left it alone and we wouldn't have noticed. 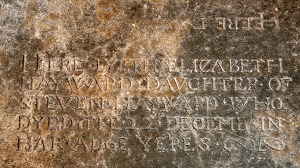 A wiser letter carver made an error on a stone at St Edmund, Fenny Bentley, Derbyshire. The second word on the stone, right at the top, in full view. 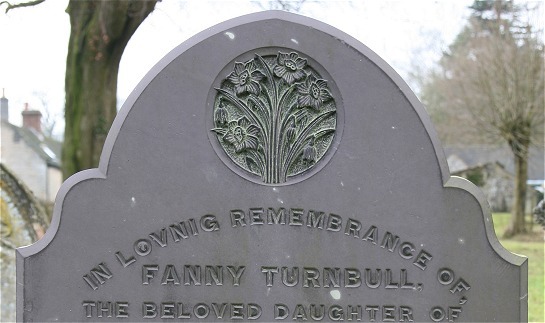 Fortunately not the name of the deceased or any of the important details, so probably never noticed. I wonder how many people have looked at this stone and walked by, not seeing the error right in front of them. We all make mistakes, we just hope they don't hang around for hundreds of years to shame us.